In many high-current laser diode testing applications, it is not possible to use a 50 Ohm termination - typically the load is closer to 1 to 10 Ohms. For these applications, Avtech offers the unique AV-CLZ and AV-HLZ1 series of transmission lines that have characteristic impedances (Z0) in this range. When a transmission line with a characteristic impedance of Z0 is used to drive a load impedance of RL, and Z0 = RL, ideal matching will occur. Under these conditions, longer-than-normal cable lengths can be used without introducing significant ringing, speed degradation, or other distortions. AV-CLZ lines are terminated with DB37 connectors. AV-HLZ models are terminated with heavier-duty Positronic connectors. Contact Avtech if you are unsure which is appropriate for your application. 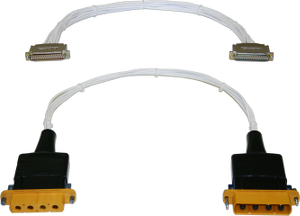 The AV-CLZ cabling solution is recommended over the older AV-LZ series of flat-ribbon cable transmission lines. Contact Avtech for cabling suggestions for your application!